Fujifilm has launched a total of 16 new cameras at CES in Las Vegas this week, including one new GPS-equipped model to let you geo-tag your snaps. 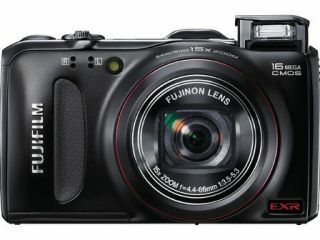 The Fujifilm FinePix F550 EXR is not the first digital camera to pack in GPS tech, but it is one of the first affordable models from a major consumer brand. The F550 also features a 16-megapixel, backlit CMOS EXR sensor, which will capture light more effectively, thus enabling you to take better holiday pics! Once you take your pictures the Fujifilm F550 will record the location data associated with them, which means you can place the snaps on a digital map – so if you are particularly forgetful then all you need to do is take pictures of where you've been and you'll never lose your way ever again. The F550 has a 15x optical zoom lens with a 24mm wide angle, equivalent to a 35mm camera. It can take raw files as well as jpegs and shoot at up to 8 frames per second, at full resolution. Elsewhere in the new Fujifilm line-up, the new FinePix XP30 also packs in GPS features in an 'extreme sports' style toughened case. If you are not so bothered about the GPS features then you might want to plump for the F500EXR, which is a fairly reasonable £280 and comes in five colours. However, if you want the (black-only) F550, then you will have to pay a little more, as that is going to cost £330 when it arrives in stores this coming March.